The Christmas break has been a very busy time for many retailers with eftpos transactions reaching 178 transactions per second at one stage! The Christmas break has been a very busy time for many retailers with eftpos transactions reaching 178 transactions per second at one stage! The recent spending splurge hasn’t been the result of conspicuous consumption by chai latte lovers in suburbia. Regions such as the West Coast and Marlborough have experienced greater retail spending than Auckland or Wellington according to Paymark data. The recent increase in spending and the relative strength of economy will be a godsend for many small businesses. However, at the same time it’s likely that many businesses will have extended credit to customers who won’t be able to pay their bills on time creating some irritating if not ghastly problems. If your business is suffering from a number of overdue accounts, it’s important to set priorities in getting back what’s yours. One way to do this is to list unpaid invoices from the highest to lowest value and concentrate your efforts on the invoice with the highest value first. Long overdue invoices, even if they amount to $5, $10, $20 or $100 can be seen as a mortal sin by a small business owner. Although it can be tempting to spend just as much time chasing small debts as large debts, it is common sense to prioritise. Creating a communications plan for how you are going to approach customers you have extended credit to is crucial. Such a plan should spell out the days before and after the invoice is due and the methods you are going to use such as a letter, email, phone or text. Make part of your comms plan changing around what you do and when. If you consistently do the same thing, customers will soon learn how long they can hold off paying you e.g. if your process is always to send a reminder letter at day 30, make a phone call at day 60 and refer to a debt collection agency at day 90, then your customers will likely know that they have a further 60 days after the due date of the invoice to pay before it gets to a collection agency. Some businesses are concerned about the image created by displaying their credit terms at reception. First impressions count and this may sit uncomfortably if poorly worded or designed. The result is that some businesses don’t have any signage or they have a sign that’s so small it’s very difficult to understand. Such an approach is ultimately self-defeating. You can’t expect your customers to understand your terms, if they can’t see them. Fortunately, it is possible to develop simple signage that won’t offend your customers. Baycorp provides a professionally designed credit terms template, which is clearly written, non-offensive and visual at no charge to clients. Judging by the requests for credit terms signs we have received, this has proven to meet the image and brand needs nicely, while supporting credit control policy and conversations with customers, before anything needs referral to us. This may seem as though it’s stating the obvious, but it’s important to know your customer before you extend them credit. So why bother with credit checking? There are several reasons. · It allows you to identify customers who might be considered to be ‘high risk’ or unworthy of credit. · You can find out more about the payment behaviour of customers hereby providing you with peace of mind. · It gives an insight into the credit history of customers and their ability to pay in the future. Importantly you don’t need to credit check every customer – just ones you do not know the customer very well and the amount of business is significant. This will help keep your costs down. All small businesses should have a credit policy. A credit policy is simply a blueprint that spells out how a business will decide who is given credit, payment dates and terms, the limits set on outstanding balances and the process to deal with overdue or unpaid invoices. If you have not reviewed your credit policy or approach, it’s important to do so. A key part of the review should the willingness of the business to accept risk. Easy credit terms can be a blessing when it comes to maximising sales growth but it can be a curse if those customers don’t pay during a period of economic stagnation or relatively high unemployment. - Is your credit policy clear and concise? - Do you collect all the relevant contact information, including email? - Does your credit control approach specify the timeframes which trigger specific actions such as a phone call or email? - After what period of time will you decide to seek the support of a reputable debt resolution expert? As a general rule of thumb, it’s advisable to contact a debt collection agency when your reminder phone calls, letters or emails have not worked. It is important to keep in mind that the sooner a debt collection agency has an overdue account and can begin collecting on it, the more likely they are to successfully recover what’s owed. If stated in your terms of trade, costs relating to debt collection may be passed on to customers who don’t pay. We are focused on breaking down some of the myths around debt collection for everyday people. Why should small businesses get advice on credit control? 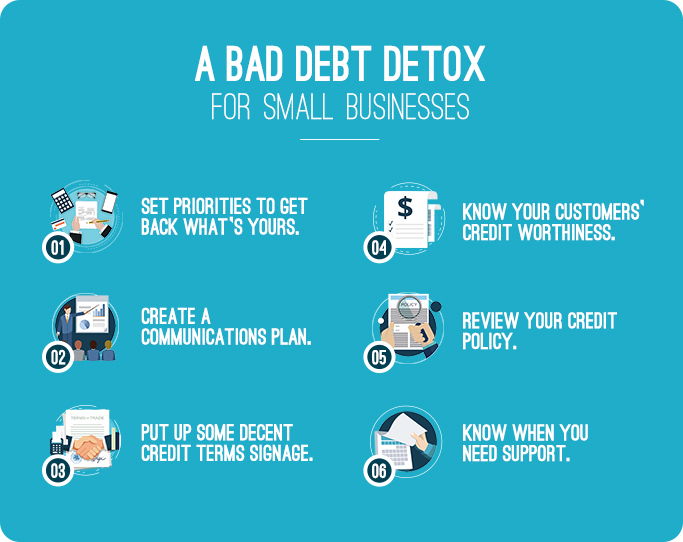 Debt recovery is often a pain point for many Kiwi small businesses but it doesn't have to be!